Sakura, Sakura and Sakura !! We went to a mountain which a local man has yesterday. Our purpose was to get Sakura trees. He has a lot of Sakura trees in his field, and when I was talking with him about Sakura he decided to give me some Sakura trees. 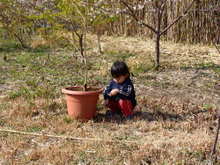 While we were talking about Sakura my son, Yuuki, was playing alone touching the soil….. This entry was posted in Family, Flower, Pension Sakuraya on 2007年2月22日 by izusakuraya. Today my wife had to do her job, so I had to be a baby sitter of my son, Yuuki. I was thinking where we go. As we had a strong wind I thought that we might be able to see Mt. Fuji from the west side of Izu peninsula today. I reseached it in the web camera site ….. Bingo !! So I desided to go to see Mt. Fuji with my son !! 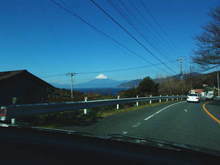 When I was driving on the way of West Izu I could see Mt. Fuji, I was very excited !! This entry was posted in Flower, nature, Sea, Travel on 2007年2月15日 by izusakuraya. After check-out of our guests, I cleaned up the guest rooms and I went to the beach with my daughters and her friends. We had a wind a little but it was very warm today too. There is a little long cliff of sand on this beach and we can play sand ski there. We did it after a long time but the children were very excited to do it. 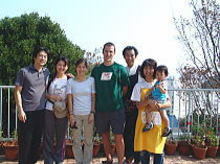 This entry was posted in beach, Family on 2007年2月12日 by izusakuraya. Yes, lovely day, Shirahama !! Today it was very beautiful day ! 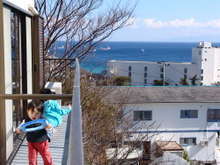 I was standing on the balcony of Japanese style room and I could see a blue sea, ships and Izu Oshima island over there. I wanted to go to the beach to take pictures of beautiful sea but I couldn’t do it because of my job. 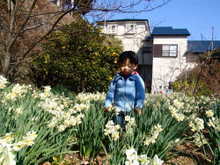 This entry was posted in Pension Sakuraya, Sea on 2007年2月11日 by izusakuraya. Pension Sakuraya – 20th Anniversary ! This year it is Pension Sakuraya’s 20th Anniversary. We decided to give the original postcard to our guests who stay at our Pension this year. I had been taking pictures for 6 years since 2000, and total number of my pictures would be more than tens of thousands pieces. 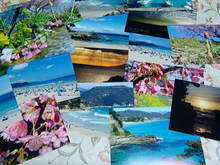 And I selected some pictures of them and made the original postcards….. This entry was posted in Pension Sakuraya on 2007年2月8日 by izusakuraya. A Giant appeared on the beach and A fish was floating in the aire. As I had a meeting today I went by walking. 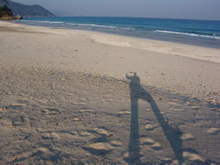 When I was walking on the beach I found a loooooong shadow. But it looks like a giant, right ? This entry was posted in beach on 2007年2月6日 by izusakuraya. It was sunny today too in Shirahama. 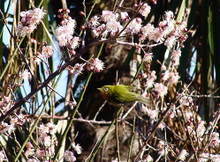 The plum trees are fully blooming and the white-eyes came to this tree to get hunny. We usually can find them two birds, they may be a couple. This is a good season for them because they can find easily many kinds of flowers in our garden. 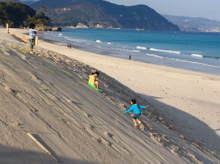 I am showing today’s Shirahama beach ….. This entry was posted in beach, Flower, nature, Pension Sakuraya on 2007年2月5日 by izusakuraya. When I was cleaning up the guest room I found that Shirahama beach was shinning with blue sea. So I desided to go to the beach with my family. "After we finish the work let’s go to the beach ! Hurry up, girls ! Finish your homework !!" 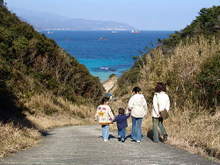 This entry was posted in beach, Family on 2007年2月4日 by izusakuraya. We got a mail from Taiwan. We got an e-mail from our guests who stayed at Sakuraya last October. In their e-mail they said that their Izu trip diary has been finished. They wrote their articles in Chinese but you can see the pictures of Sakuraya at least. Please check the webpages, DAY3, DAY4 and DAY5. This entry was posted in Pension Sakuraya on 2007年2月2日 by izusakuraya. We had a strong western wind yeseterday, so I was thinking that it would be cold today. In Japan they had snow in many cities today, but it was very warm here in Shirahama. Today we had guests, so I went to our garden to pick up the flowers for the decolations with my son. In our garden the narcissus flowers had already finished in the same stage of last February, but they are full blooming this year. ….. This entry was posted in Flower, Pension Sakuraya on 2007年2月2日 by izusakuraya.